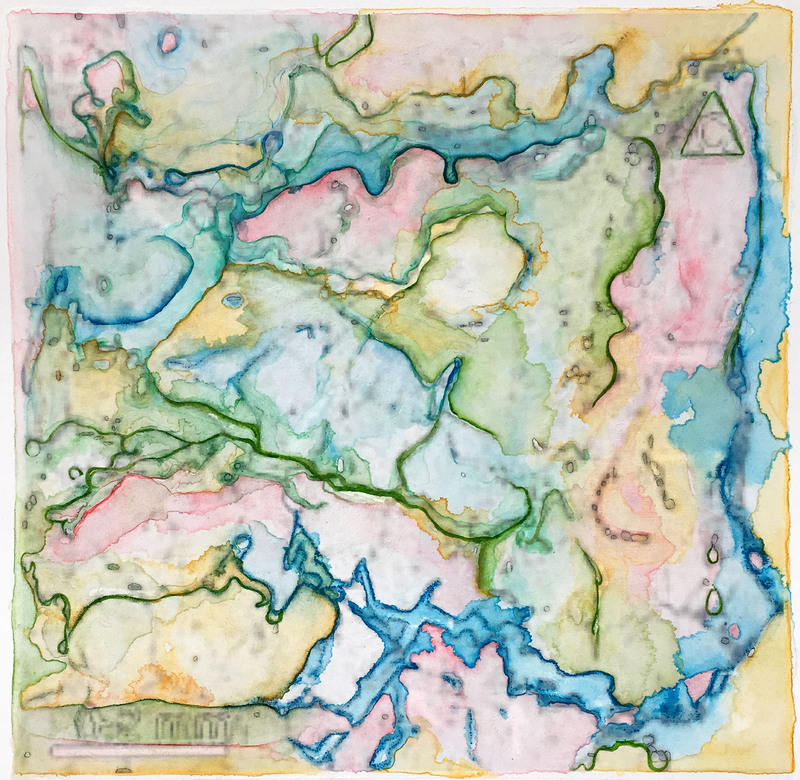 Mapping the Invisible#5 Redux: Ignimbrite Microbials ©2018 Janet Maher, gouache, watercolor, white gesso and pencils on transparent gesso over altered digitized image, mounted on printmaking paper, w/assemblage. 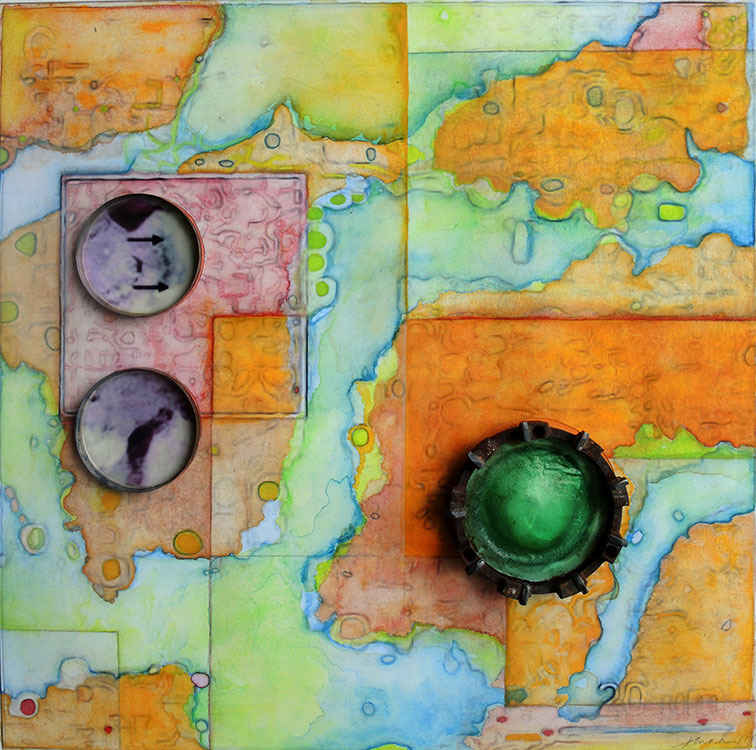 Image: 13 ¾” x 12” x .75"
Mapping the Invisible#4, Redux: Endolithic Cells ©2018 Janet Maher; gouache, watercolor, white gesso and pencils on transparent gesso over altered and collaged digitized image, mounted on printmaking paper, w/assemblage; Image: 13 3/8" x 13.5" x .75"
Gaia: Origin #4 © 2018 Janet Maher, mixed media collage drawing (laser print collage w/pencil drawing on printmaking paper, dimensional attachments; image size: 20"” x 18 1/4" x 1/2”; matted and framed 26" x 25" x 2"
Janet Maher is a Professor of Art who works in many disciplines and has taught a wide range of courses at Loyola University Maryland, Baltimore, where she directs the Studio Arts program. 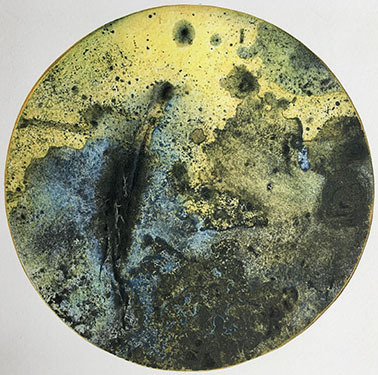 Her prints, drawings, bookworks, collages, assemblages, digital images, works in clay and in multiple forms of mixed media have been widely exhibited and are in many private and public collections. She has also published two scholarly books. 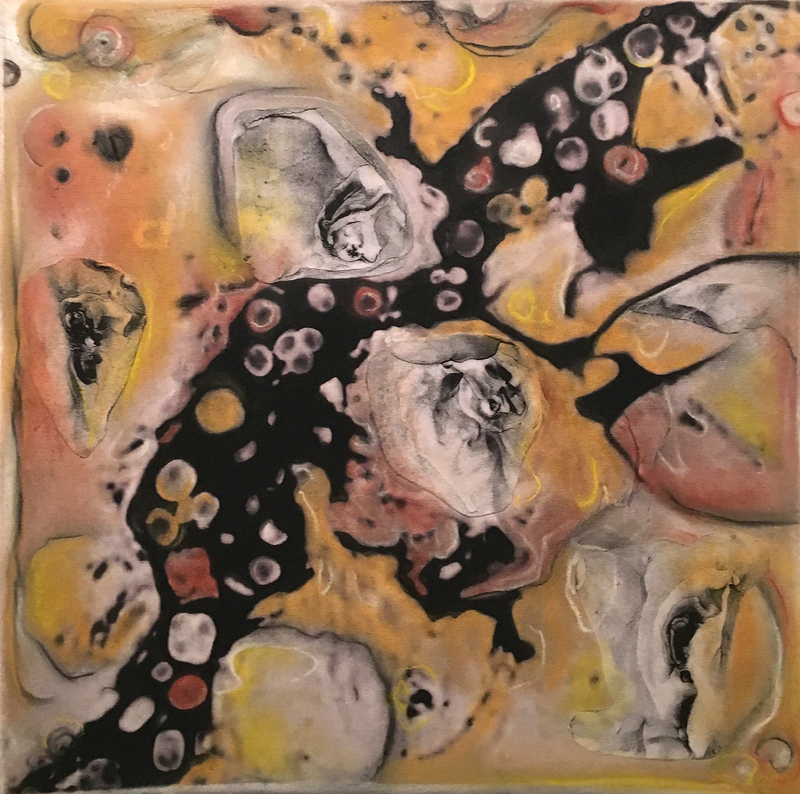 As the planet is now fully immersed in the Anthropcene period, I choose to create abstract art images that can be interpreted at both micro and macro levels. I am responding to what captivates my waking thoughts regarding the dilemma of humans’ impact upon the earth. 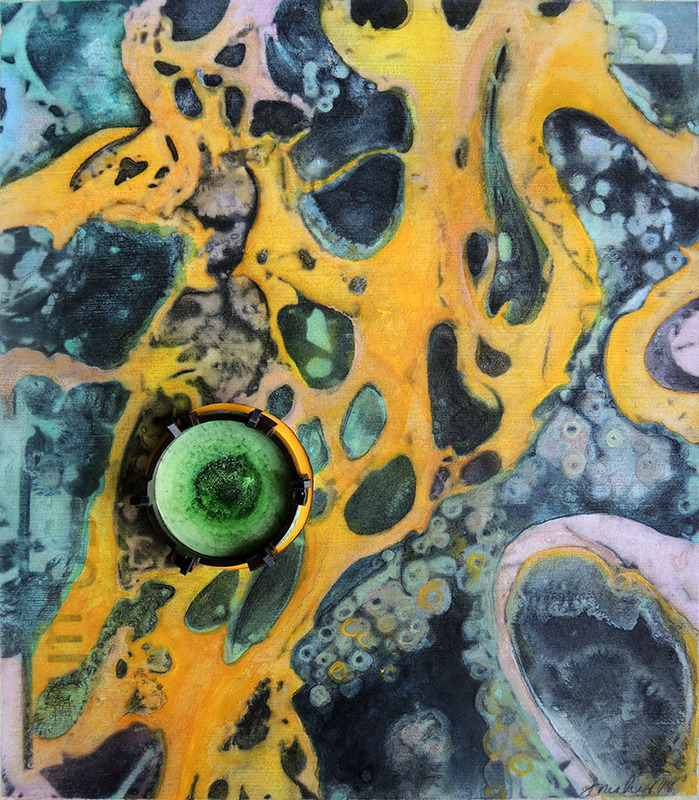 Within the overarching theme, Gaia, I work in several ways with toner-based mixed media images. 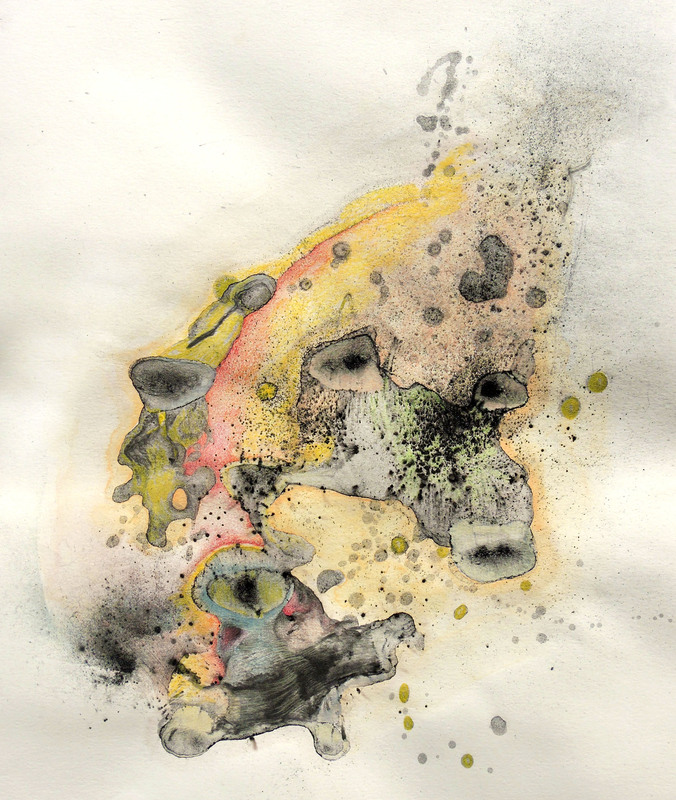 I call my mixed media drawings "Origin" and my transfer and mixed media prints are "Specimen". 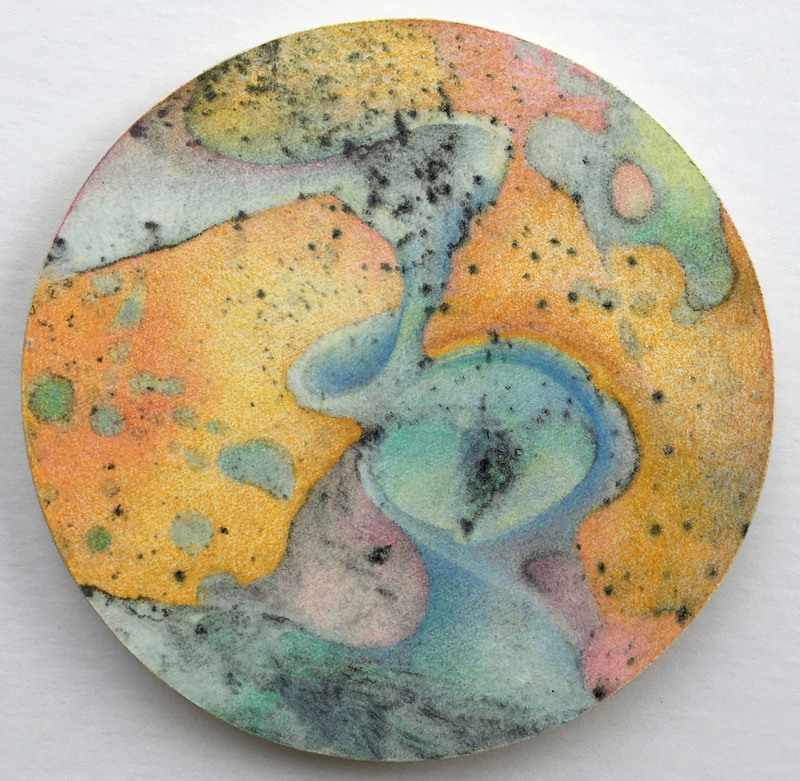 "Petrie" are small mixed media drawings that began as residue elements from "Origin" then served as the basis for larger "Specimen" works. All three sub-series continue. 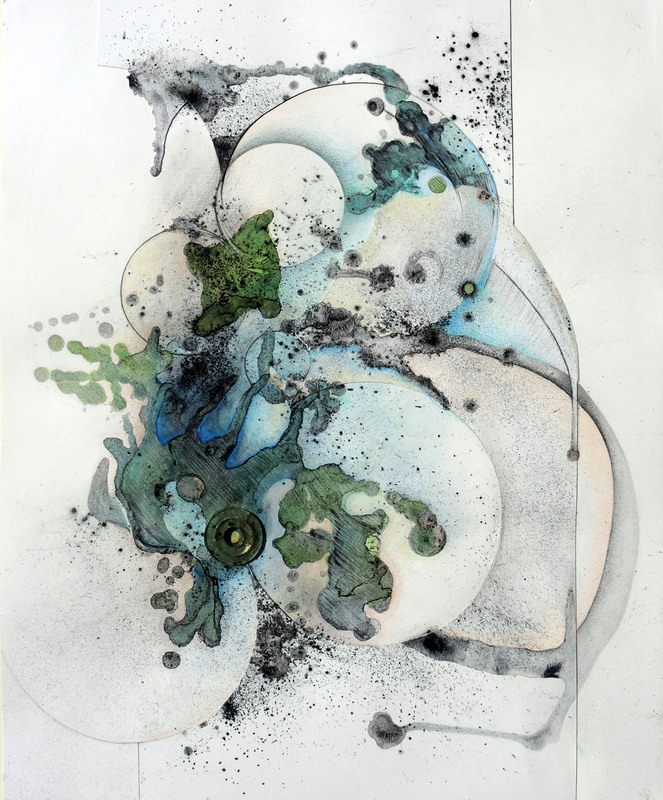 Gaia: Origin #3 ©2018 Janet Maher, mixed media collage drawing, heat-set toner, completed through drawing with colored pencils and graphite; framed 22" x 17"
Gaia: Origin #2, ©2018 Janet Maher, mm collage drawing; heat-set toner, completed through drawing with colored pencils and graphite; image: 14 3/4" x 10 7/8"; framed 17" x 22"
Gaia: Origin #1, ©2018 Janet Maher, mm collage drawing; heat-set toner, completed through drawing with colored pencils and graphite; framed 17" x 22"
Gaia: Specimen #2 ©2018 Janet Maher, wintergreen oil transfer print with drawing; image abt. 9.5", matted and framed 16" sq. 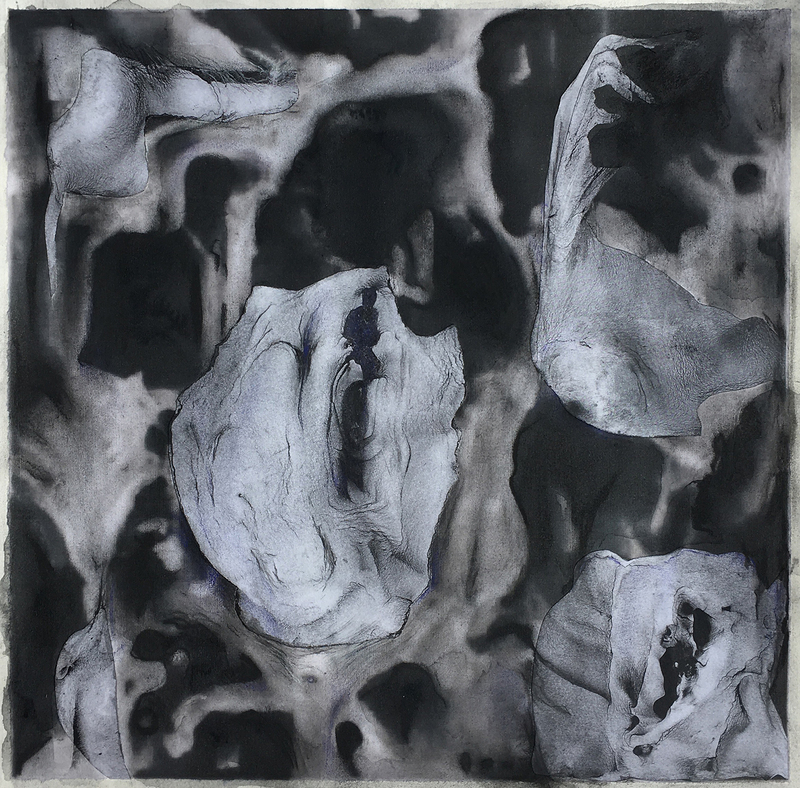 Gaia: Specimen #1, ©2018 Janet Maher, wintergreen oil transfer print with drawing; image abt. 9.5", matted and framed 16" sq. 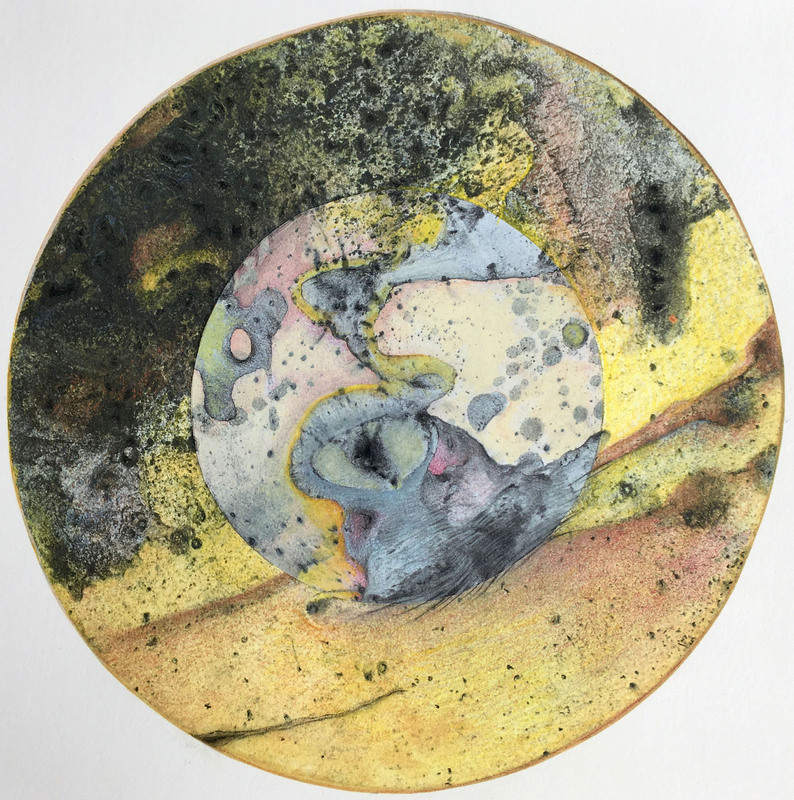 Gaia: Specimen #3, ©2018 Janet Maher, wintergreen oil transfer print with collage and drawing; image abt. 9.5", matted and framed 16" sq. 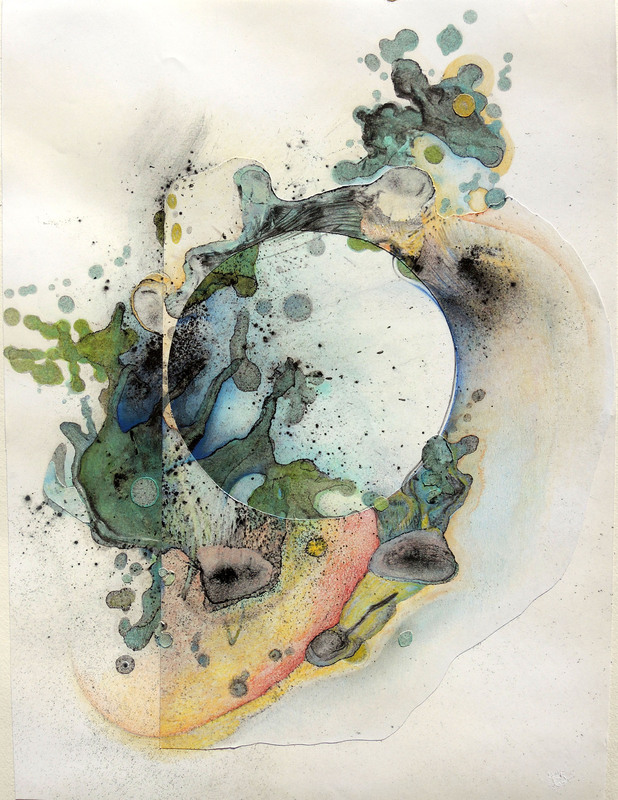 Gaia: Specimen #4 ©2018 Janet Maher, mixed media drawing, collage on printmaking paper; image abt. 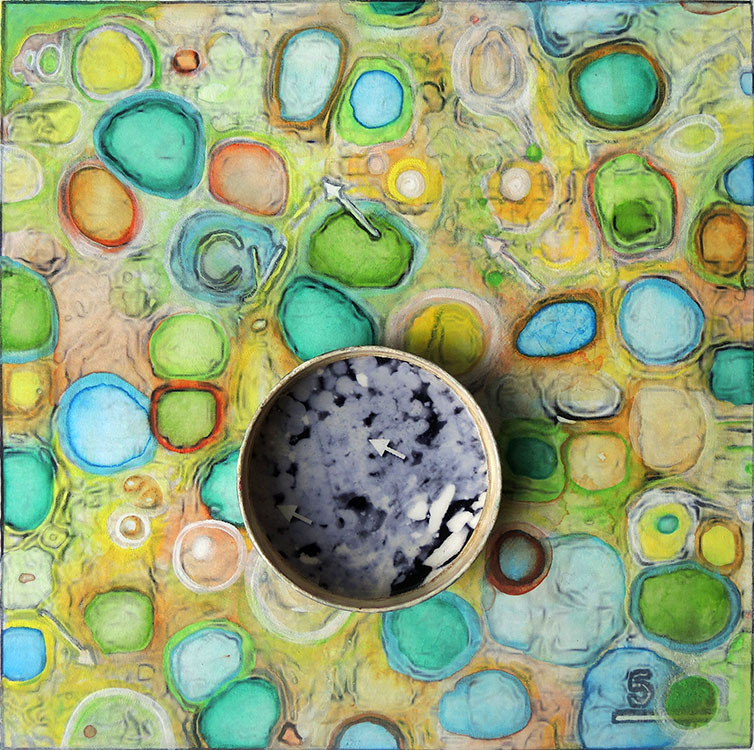 9.5"; matted and framed 16" sq. 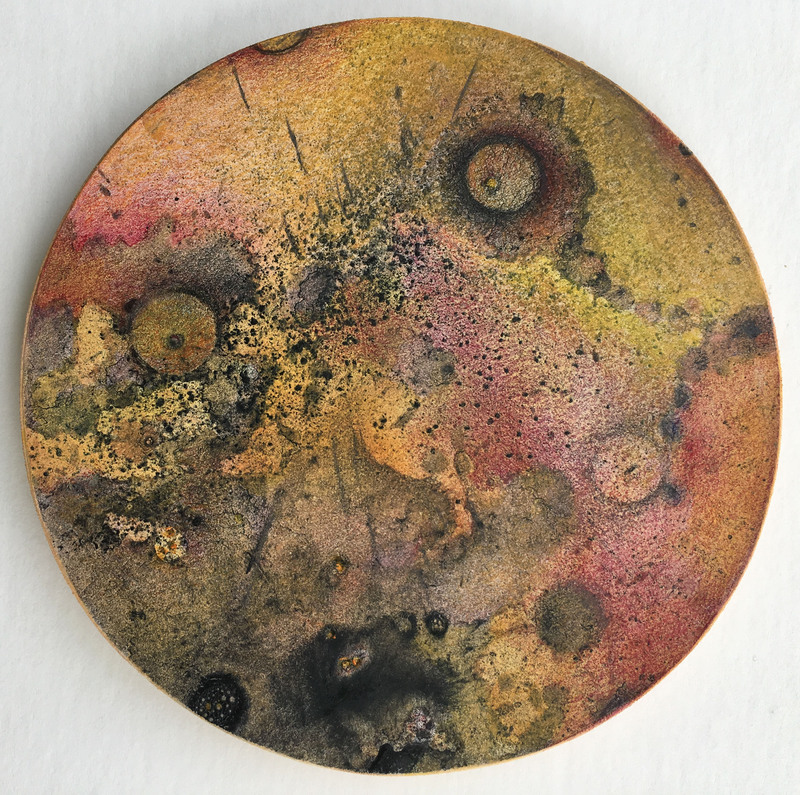 Gaia: Petri #2 © 2018 Janet Maher; mixed media drawing, heat-set toner, gouache wash, colored pencils, mounted on wood, 4" diameter x 1/4"
Gaia: Petri #5 © 2018 Janet Maher; mixed media drawing, heat-set toner, gouache wash, colored pencils, mounted on wood, 4" diameter x 1/4"
Metaphorical thinking regarding concealed and revealed macro/micro forms sparked open-ended questions and a new chapter in my artwork. A collaboration opportunity brought me together with Dr. Jocelyne DiRuggerio, a research biologist at Johns Hopkins. I enjoyed working with her material so much that after the exhibition I wanted to continue the series. 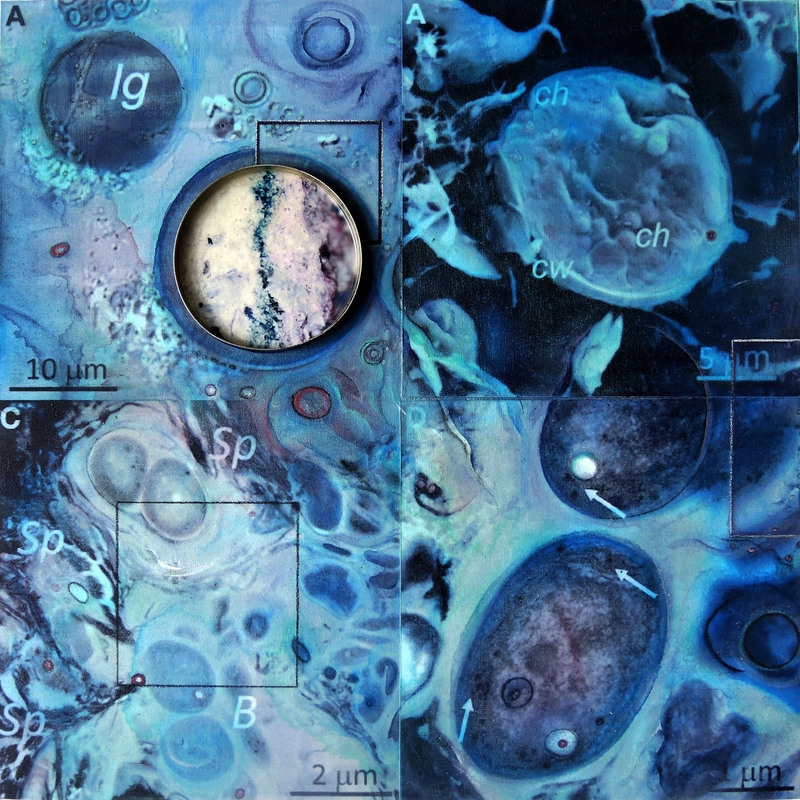 I used digital technology initially to enlarge 1" artifacts from research papers of DiRuggerio and her team regarding their examinations of microscopic subterranean life in the Atacama Desert, Chile. Using Adobe Photoshop to strip away value and enlarge thumbnail details I was able to alter and transform their original structures into abstract mixed media drawing/paintings. 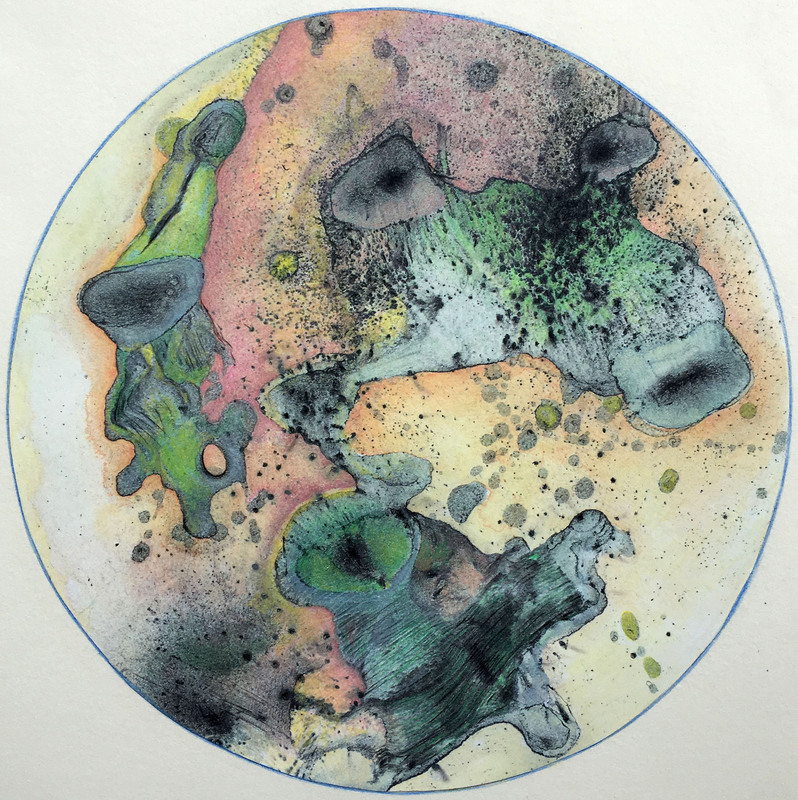 They include various combinations of gouache, watercolor, chalk pastel and charcoal, the last of this group also containing material of my own (specifically lithographic toner wash tests). Having been immersed photographically and digitally for the last decade, it was refreshing to return to my first love, drawing, through this project. 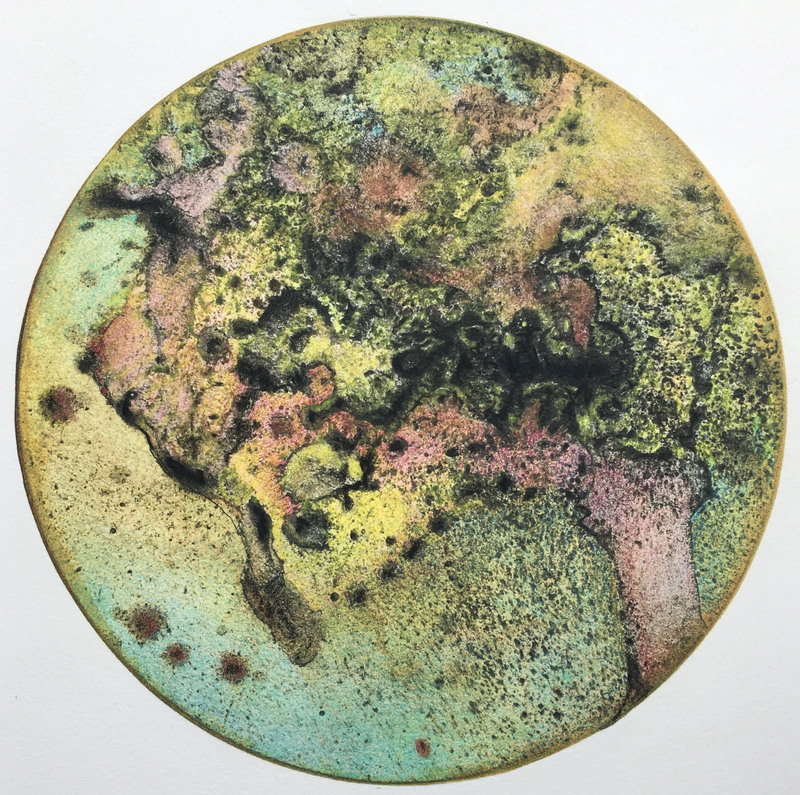 After creating works in my ongoing Gaia series, I revisited and updated some of the Mapping the Invisible images during summer, 2018. 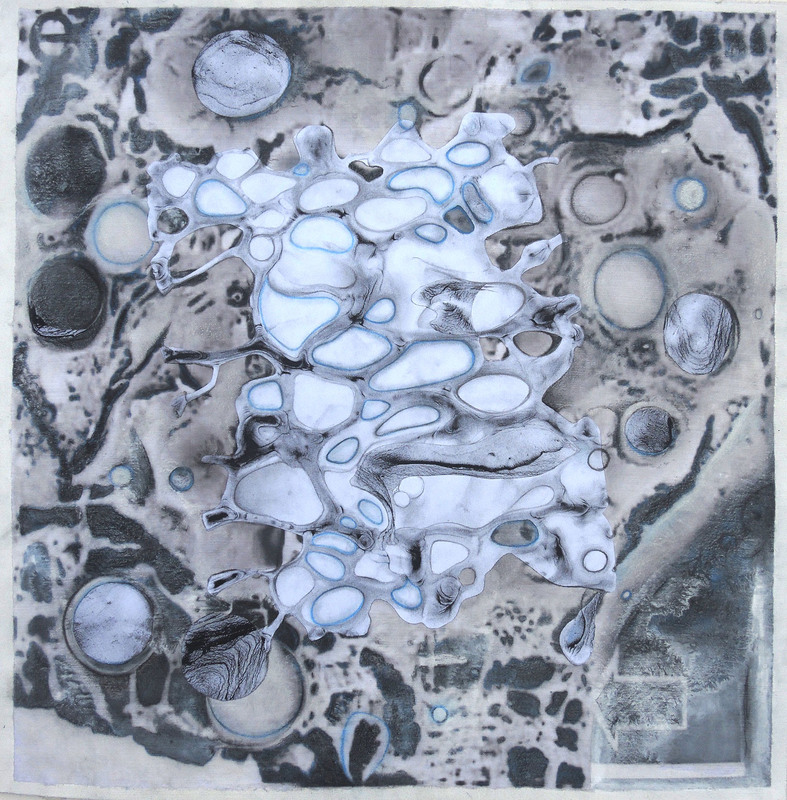 Mapping the Invisible #7: Altered Extracellular Polysaccharides ©2016, transparent gesso over altered digital image with collaged toner lithography, charcoal, gouache, various pencils; matted and framed 21" x 20"
Mapping the Invisible #8: Tilo Rhyolite Colonization ©2016, transparent gesso over altered digital image with collaged toner wash prints, pastel, gouache, various pencils, mounted on printmaking paper; matted and framed 21" x 20"
Mapping the Invisible#4, Revisited: Chasmoendolithic Habitats ©2018 Janet Maher; gouache and various pencils on transparent gesso over altered digitized image, mounted on printmaking paper, w/metal and image assemblages; Image: 15.25" x 15 3/8" x 1"
Mapping the Invisible: Chasmoendolithic Habitats #2 ©2018 Janet Maher, gouache, watercolor, white gesso and pencils on transparent gesso over altered digitized image, mounted on printmaking paper w/assemblage. Image: 11 1/8" x 11.25" x .75"